Every year each American Legion Post awards the title of Legionnaire of the Year for his or her meritorious service to the post and community. This year’s recipient was given to Post 149 Commander, Ron Wheeler. 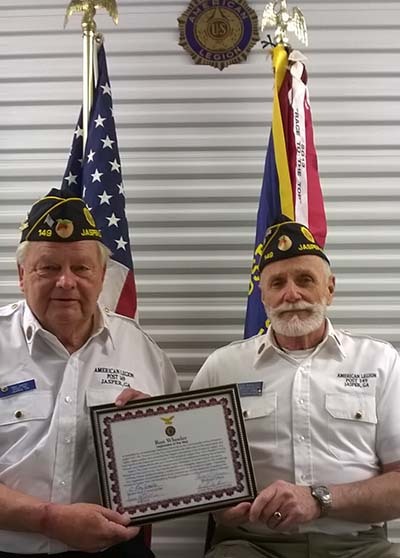 Serving now in his third year as post commander, Wheeler has been an active member of the Jasper based American Legion Post 149 for seven years. His selection as Legionnaire of the Year came as a surprise. “I didn’t realize as commander I could even be eligible”, he spoke humbly. Wheeler served two years in the Army with a tour in Vietnam as an OV-1 Mohawk observer. His second year was as an instructor at Fort Wachooca teaching survival skills, escape and evasion and cockpit orientation for future Mohawk observers.